Get out the notebooks because its time to explain how a game that came out over 12 years ago featured an ending vastly better than anything else on the market. Writing about the ending to Brother’s prompted thoughts of all the video games I’ve played and consider the best ending experienced. My personal catalogue is vast and seldom a game is played without reaching its end; so considering every ending was conceptually a very daunting task. Lucky for me that one ending stood so far out ahead of everything else, it didn’t take too long to come to a conclusion: Silent Hill 2. Obviously key aspects and narratives of Silent Hill 2 will be discussed in this piece so even though this is an old game I am going to issue the obligatory Spoiler Alert! DSB: How About That Ending to Brothers! Now that we all agree that Silent Hill 2 is a great game; let me now try to explain to you why its ending is the best in the history of gaming. First, let’s think about what we want out of video game ending. Traditionally, most would agree that a finite stopping point to the story is key to a good ending (none of that alluding to a sequel business). In a perfect world, perhaps resolution to the tensions and hardships faced throughout the main narrative are clearly given. Revelations and explanations are also a plus as long as they are thematically consistent. When the credits role, gamers should be left with a feeling of satisfaction as it relates to the story. Some games get this right, others fail miserably. Silent Hill 2 ends in a very satisfying albeit tragic way. James Sunderland, the main protagonist, is summed to town by a letter he received from his wife which is especially troubling as she tragically passed away due to illness three years ago. He goes through the game chasing after his beloved wife Mary and roams the streets of Silent Hill. While exploring the town, he encounters a mentally unbalanced ensemble cast and through them realizes that Silent Hill is a prison whose cells change to specifically torment its visitors based on their past sins. For James, his Silent Hill consists of dark fog, isolation and deformed mutated woman roaming the streets trying to kill him. James is confronted with the fact that perhaps he did not love Mary as much as he thought and that she could not have died three years ago. The town of Silent Hill creates a ghost of Mary named Maria who embodies everything James wished Mary could be. She is hyper sexual, fun and most importantly not ill. James then realizes through his journey that he killed Mary. James is tortured by his true intention for euthanizing his wife; did he kill her because he did want her to suffer anymore from her illness which lasted over three years or did he kill her because he wanted his life back? As these revelations unfold, James heads to the final boss encounter ready to meet his fate. Everything about this story holds no options for happy endings. Mary is dead, nothing can change that and James trip through the game was in service to make James realize that he is as much of a monster as anything that he found roaming the streets in Silent Hill. The entire ending revolves around James motivation for euthanizing Mary. Why did James truly murder his wife? Silent Hill is about judgment and absolution; if James really did wish to end his wives suffering then he must be spared. If he selfishly wanted his life back, then the town will give him his just rewards. The ending to Silent Hill 2 executes this through multiple options changing the final boss of the game based on whether or not James truly felt remorse. In general, I find it hard to believe quality endings are achievable through the “multiple endings” tactic seen in many games. Stories tend to have arcs and interactions with characters that have direction which gives the feeling that “everything has led to this”. Due to this endings have a sense of inevitability and when multiple endings enter the equation, how can they possible have separate and unique outcomes that still make sense in the parameters of which the preceding story has laid out. At the end of last year’s Far Cry 3 you are given a choice with either saving or sacrificing your friends with the press of a button. At the end of Dues Ex, three options are presented for selection to determine the end of the game. In Mass Effect 3, red blue and green are your selections. Press X for the good ending and press Y for the bad ending. Press A to express remorse for killing your wife, press B to admit you’re not sorry. Could anything ring more hollow? Yes, Silent Hill 2 has multiple endings but the devils in the details and its how you go about achieving those endings that make Silent Hill 2 so brilliant. At the end of Silent Hill 2 you never actively select what ending you want because its all been determined before you got there. There are no inventory requirements or side missions that must be completed to achieve a certain ending. No party members must have survived a level, no Mini-Boss must be defeated, no dialogue options must have been selected or secret weapons must be obtained. So how does Silent Hill 2 determine your ending? Simple: it’s based on your behavior. Your behavior is the key factor to determine how your stay in Silent Hill will end. Principally, there are really 3 endings to Silent Hill 2 (Technically there are 6 in total but some of them are joke or alternate endings). These three endings are entitled “Maria”, “Leave” and “In Water”. It’s also important to note that all three main endings are thematically consistent with James Sunderland’s story arc and as discussed before it could have ending a couple of different ways. If the endings where out of scope of the potentially outcome it might not work as well as it does here. Throughout the game, James behavior and by extension, the player’s behavior is monitored to judge what ending makes sense based on their actions. If you really want to know the ins and outs of the system you can read this FAQ which details everything, but lets talk about the “In Water” ending. Notice any patterns here? In the game if you examine the knife Angela was planning on slitting her wrists with, stay in low health in the game (basically acting reckless) and don’t use healing items you are displaying a lack of a will to live. In order to get the “In Water” ending, you must display suicidal tendencies in the game in order to finally kill yourself at the games conclusion. There are similar parameters for the other two main endings. If you truly did love your wife, you have to ignore her sexualized ghost Maria and occasional look at the photo of Mary, proving you still think about her in order to get the happier “Leave” ending. If you are not sorry for her murder, then you must spend more time with Maria, never look at the picture of your wife and protect Maria to the “Maria” ending. The In Water ending in all its morbid glory. Imagine the implications if this system was adopted by other games. So many games give us the freedom to do whatever we want without consequence. While this makes for a good “escape from reality” it hardly can give stories the bite they need when no stakes or repercussions are in play. What if you shoot an innocent bystander in a game because the game lets you do it, but then are faced with an ending in which you are deemed a horrible sociopath? What if you are faced with meeting the families of every enemy you have slain in a game and realized there was a way to non-violently proceed all along. I am a big believer in "actions speaking louder than words". I am sure we think we are all "good" people, but what would happen if games gave their conclusions based on the actions we have taken in our games, not just answering a question of "what ending do I want?" What I am talking about is contextualized endings in line with game narratives whose outcomes are determined by player behavior rather than player selection. Playing a game with this idea fully realized would be amazing. Imagine what we could learn about ourselves in relations to our morals and principals if the end result of our gameplay was a reward for our purity, a monument to our sins or a more realistically complex fallout of our decisions. No more could players play like a renegade for the entire story and then select the good ending just because they wanted one. This could open the potential for the player to actively become a story component as much as its main characters, which is an exciting idea. 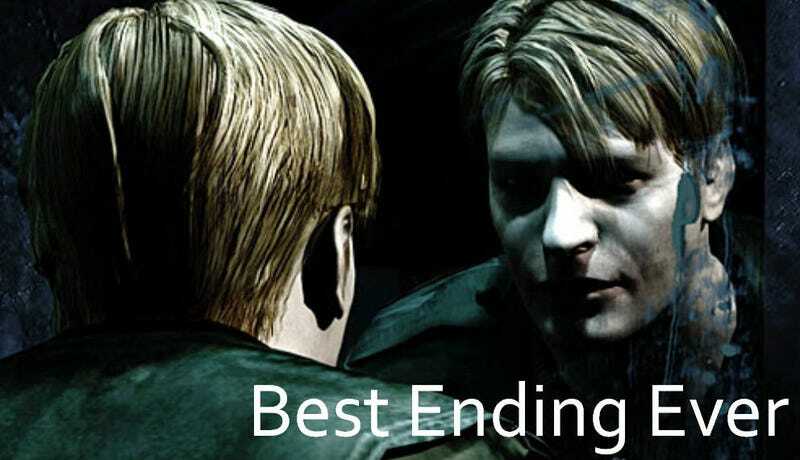 In this sense, Silent Hill 2 has a strange and unique marriage with its relationship to the player, James and the ending itself. It gives equal input into the actions of each resulting in a democracy of storytelling. It’s a shame that this system seems to have never been picked up, but its execution in Silent Hill 2 is masterful and no game since has been able to delivery such a deep and complex story whose outcome is not only satisfying but in line with how you played the game.